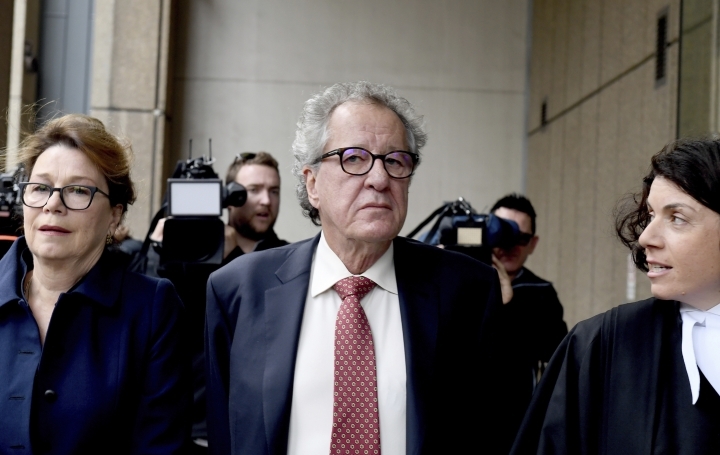 CANBERRA, Australia — Oscar-winning actor Geoffrey Rush won his defamation case on Thursday against a Sydney newspaper publisher and journalist over reports he had been accused of inappropriate behavior toward an actress. The 67-year-old Australian had sued The Daily Telegraph's publisher and journalist Jonathon Moran over two stories and a poster published in late 2017. The reports alleged inappropriate behavior toward co-star Eryn Jean Norvill by Rush while he was starring in the Sydney Theatre Company's production of "King Lear" in 2015 and 2016. Rush's lawyer Bill McClintock told a three-week trial that ended in November that the actor might never work again because of the newspaper's reports. Rush's phone may not ring with job offers and he may never regain his confidence and desire to work, his lawyer said. Rush outside court thanked his family for their support "during this harrowing time." "There are no winners in this case. It's been extremely distressing for everyone involved," he told reporters. He argued that the newspaper, which used a headline "King Leer," portrayed him as a pervert and sexual predator. Wigney was scathing of the newspaper's reporting. "This was, in all the circumstances, a recklessly irresponsible piece of sensationalist journalism of the very worst kind," the judge said. "It was difficult to avoid the conclusion that it was calculated to damage." Norvill, who played Lear's daughter Cordelia in the production, did not speak to the newspaper before the articles were published, but agreed to testify for the newspaper at the trial. The 34-year-old actress testified that while she was playing dead, Rush stroked his hand across the side of her right breast and on to her hip during a preview performance. Rush denied allegations that he deliberately touched Norvill's breast, her lower back under her shirt when they were backstage or making lewd gestures and comments toward her. Wigney said on Thursday he did not find Norvill's evidence "credible or reliable" while he accepted Rush's testimony. "I never wanted these issues dealt with by a court. This case has caused hurt for everyone," Norvill said. "There are no winners, only losers." Sydney Theatre Company had said in a 2017 statement Norvill complained of Rush's "inappropriate behavior" after the production ended. "At the time the complaint was made, the complainant requested that the matter be dealt with confidentially, and did not want Mr. Rush notified or involved in any investigation," the statement said. The company said it complied with the request "in the interest of the complainant's health and welfare." Norvill said on Thursday she would have been content with an apology and "a promise to do better." "We need to make genuine, cultural change in our professions and industries," Norvill said. "We can do it, but only if we acknowledge and confront with honesty the problems and the complexities of the power imbalances in our workplaces." The Daily Telegraph's editor Ben English said he was reviewing the judgment. "We are disappointed with Justice Wigney's findings, in particular his dismissal of Eryn Jean Norvill's evidence," English said in a statement. "We disagree with his criticisms of her and she has our full support." In an unrelated allegation, "Orange Is the New Black" actress Yael Stone told The New York Times in December that Rush engaged in sexually inappropriate behavior when they starred in "The Diary of a Madman" in 2010. In a statement, Rush said the allegations "are incorrect and in some instances have been taken completely out of context." Rush won the best actor Oscar in 1996 for his portrayal of pianist David Helfgott in "Shine" and was nominated for roles in "Shakespeare In Love," "'Quills" and "The King's Speech." He is also famed for his portrayal of Captain Barbossa in the "Pirates of the Caribbean" films. He received his nation's highest civilian honor in 2014, the Companion of the Order of Australia, for service to the arts.